I’m sure you’d have experienced your mother running after you with almonds in her hand. Whether you’re a student, working adult or pregnant lady, you’d have been asked to take almonds at one time or another. Not only are almonds part of several recipes, they are also eaten as it is or soaked overnight. 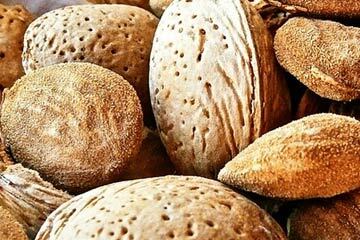 Our ancestor discovered the health benefits of almonds long time ago, and that’s the reason it is one of the most advised eatable thing that exists. Whatever you might be doing, almond is going to benefit you in one way or another. Let us take a closer look at all the health benefits almonds have to offer us. Vitamin E is essential for a healthy skin. It contains alpha-tocopherol which nourishes the skin and makes the skin glow brilliantly. Almonds are a great source of Vitamin E. Thus, consuming almonds would help your skin fight off various skin related issues like dark spots, acne, pimples and blemishes. Almonds help in increasing the good gut bacteria. These gut bacteria aids our body in better digestion. A good digestion keeps your bowel motion healthy, avoiding complaints like constipation. Also, besides improving gut bacteria, the fibers in the almonds help with constipation too. Now it’s no secret that chronic constipation also leads to skin problems like acne and pimples. Hence, eating almonds helps in clearing bowels alongside keeping skin healthy both directly and indirectly. Almonds are rich in fiber, vitamin E, magnesium, monounsaturated fat and antioxidants, all of which helps in improving the blood flow. The fibers also block the fat absorption which is good for heart’s health. On top of that almond’s cholesterol lowering property protects the heart, keeping it healthy. There is no doubt that almonds contain anti-aging abilities. Pure almond oil massage on the face, particularly under eyes, helps averting wrinkles. Regular applying almond oil on your skin would also help lighten the dark spots and dark circles, hence keeping your skin beautiful and skin tone even. For this reason almond oil is part of several beauty products. Again almonds have been known as memory boosters for long time. Almonds are rich in many essential nutrients which boost the memory and helps in decreasing the chances of Alzheimer’s disease. Almonds contain magnesium and riboflavin, both of which are known for enhancing energy thus keeping you fresh all day long. Almonds also improve your efficiency at work. Almonds also help in losing weight. They have many minerals, vitamins and variety of other nutrients which tend to restraint your appetite for carbohydrates. Now, everyone knows it’s those carbohydrates that add to the extra weight, besides the fats. So adding the almonds to your diet is certainly going to keep you fit and healthy.